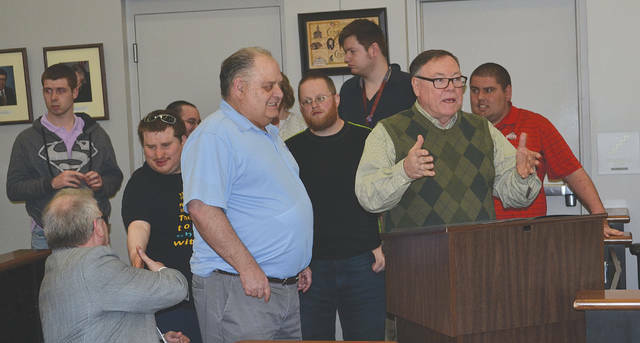 Urbana Mayor Bill Bean is joined by clients of the Champaign County Board of Developmental Disabilities as he reads a proclamation supporting the month of March as Developmental Disabilities Awareness Month. Urbana City Council President Marty Hess on Tuesday broke a tie vote, tabling a resolution authorizing the city to enter into an agreement with DriveOhio to participate in the autonomous vehicle pilot program and promote autonomous vehicle testing sites in the city. Council member Dwight Paul made the motion to table the resolution. His motion was supported by council members Cledis Scott and Ray Piper. Council members Eugene Fields, Doug Hoffman and Pat Thackery opposed tabling the ordinance. Hess noted that he is rarely called on to break a tie, and rarely votes in favor of tabling a resolution, but said this agreement should have been brought up at a work session so that council members had more time to consider it. The next work session is scheduled for Tuesday, March 26, during which this resolution is expected to be discussed. Council unanimously passed a resolution accepting the report of the Urbana Tax Incentive Review Council on the status of the Enterprise Zone and Community Reinvestment Area agreements, a resolution authorizing the director of administration to apply to the Ohio Department of Transportation under the small city program for improvements to South High Street, and a resolution indicating local support of an application by the developers of Legacy Place to the Ohio Historic Preservation Tax Credit Program. This application concerns plans to create senior housing in three unused structures: the former Douglas Hotel, Urbana South Elementary and Urbana North Elementary. Council heard the second reading of an ordinance sponsored by council member Piper that includes lawn clippings in the city’s definition of “litter.” Council member Paul repeated that there may be some difficulty enforcing this ordinance and had not yet decided how he may vote on it. City Law Director Mark Feinstein said that Piper wanted lawn clippings added to section 531.08 of the Urbana code, which specifically addresses litter, because defining it as litter not only gives the city the ability to deal with it if it’s a nuisance, but also assesses criminal penalties for littering. Council voted 4-2 to authorize the administration to enter into a unit price contract with Strawser Paving Company Inc. of Columbus for the 2019 Sidewalk, Curb and Gutter Replacement program in an amount up to $105,231. The city is responsible for $29,261.80 of this contract to complete curb and gutter replacement, drive approaches and curb ramps in areas where paving is planned for the summer of 2019. Private property owners are responsible for $75,969.25 of concrete work prior to summer paving, based on uncompleted work as of mid-February. The final contract value may adjust based on work completed privately by property owners prior to this spring’s deadline for work completion – April 19, 2019. Notifications to property owners required to pay for repairs were issued last September. Council members Scott and Piper objected to passing the bill, both saying property owners should not be required to pay for curb and gutter replacement. According to Bumbalough, Strawser’s bid of $43.88 per foot was significantly less costly than the second lowest bidder. – The mayor issued a proclamation supporting the month of March as Developmental Disabilities Awareness Month. – City Administrator Kerry Brugger announced that the compost facility is open and would be open until Saturday. April 23. – The meeting ended with an executive session concerning personnel.